People nestle in like ticks to discuss the subjunctive . . . 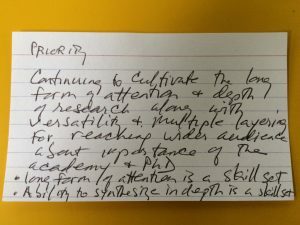 If this second of three discussion sessions had an organizing concern, it had to do with speed versus slowness in the accumulation and dissemination of knowledge. A Classics professor noted the pleasure specialists take in lingering over the fine points of grammar (“people nestle in like ticks to discuss the subjunctive”), while an American Studies specialist noted that the long form of the dissertation is linked to long forms of attention, expressing a worry that the latter might be lost when there is a push to make things more easily digested. A Musicologist, noting time-to-degree pressures, suggested that graduate students are increasingly reluctant to delve into areas of specialization that require facility in a foreign language. The group, which also included a poet and two historians, saw the value in short-form and swiftly-published modes of writing like the blog and the tweet, recognizing how they can get students writing about their intellectual projects sooner and more regularly (“writing is a muscle; you need to be writing every single day,” noted a scholar/blogger), and how they make work accessible to a broader public (in a “turn toward public history and public writing”). One participant noted how an ability to write for different audiences will serve students interested in careers as diplomats and grants administrators, many if not most of whom have PhDs. 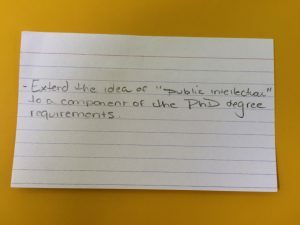 Another person noted that a recent history PhD built a large network of people interested in her work by means of blogging and tweeting research in progress. The group also discussed how university hiring practices might serve students making the transition from graduate school to the job market. 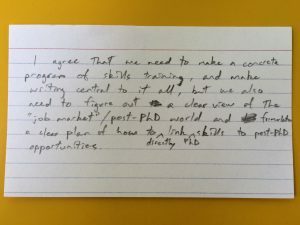 Participants speculated about whether the UI could forge relationships with other institutions so that, for example, rather than developing post-docs for our PhDs, we developed post-doc relationships with other universities. In this way, our recent graduates could be exposed to new ideas and ways of doing things at other institutions, and those institutions’ recent PhDs could do the same at the UI. A similar relationship might be imagined for alt-ac internships. 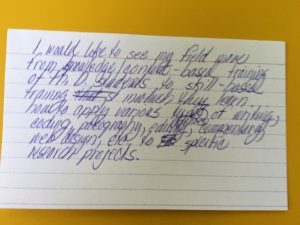 Some of the participants’ personal priorities are communicated on the index cards included in this post. 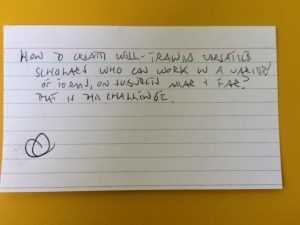 Previous Previous post: How to create the most successful intellectual project . . .
Next Next post: If there’s a way we can indoctrinate people not to be indoctrinated . . .